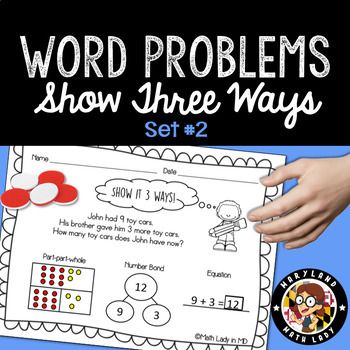 1st Grade Word Problems SET 2 - Show It 3 Ways! Understanding (and teaching) first grade word problems can be challenging! First graders need to be able to read and understand word problems, represent them, write an equation, and solve them. This no prep SET #2 of problems based on common core addition and subtraction story structures will help you model for your students how to become successful word problem solvers! Students will show the problem using a part-part-whole model, then represent it using a number bond, and finally will connect those models with an equation - it's that connection between the problem, the models, and the equation that you want students to make! ★ Check out the full preview! • Show It Three Ways BUNDLE! ★★★★ 4 Star reviews make these resources great additions to your classroom! 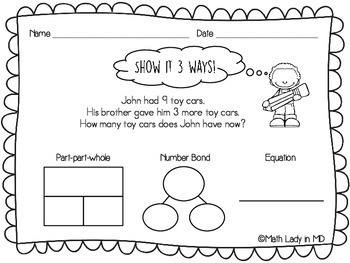 • 1st Grade Compare Word Problems SET 2 - A Graphic Organizer that Actually Works! 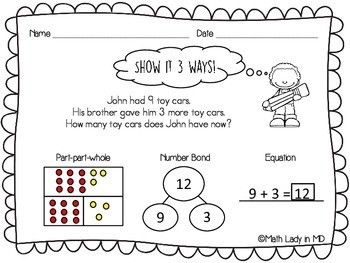 • 1st Grade Compare Word Problems SET 1 - A Graphic Organizer that Actually Works! • 2nd Grade Two Step Word Problems - Close Reading! • 2nd Grade Money Word Problems - Close Reading! • 3rd Grade Perimeter Word Problems - Close Reading! • 3rd Grade Elapsed Time Word Problems - Close Reading! • 3rd Grade Word Problems - Close Reading! • 3rd Grade Two Step Word Problems SET 2- Close Reading! • Match Up - Building Better Problem Solvers. For Kindergarten, 1st, 2nd & 3rd. • Fact Fluency Games Tool Kit: Addition and Subtraction Facts – includes 56 Domino cards!